One of the very important question is how to transfer Euro to India. There have been various methods like Western union money transfer, German Bank etc. With our own experience we recommend following services. These services are easy to use and safe. We recommend Transferwise for it's best rates and quick turn around time. 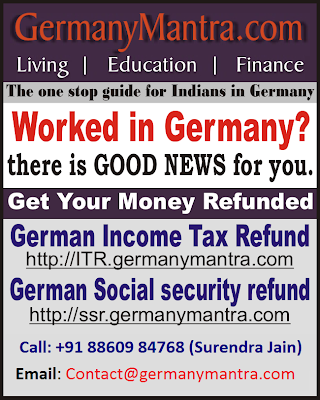 To avail dependent support income tax benefits in Germany, ensure that you start transferring money to your dependents in India (parents, parents-in-laws, spouse) etc. at the earliest. For each dependent your income will be reduced by Euro 2050 per person per year for the tax calculation purposes. Download your bank statements in pdf format every month/quarter and keep them safe for future reference. Online Bank statement are not available for more than 6 months. ICICI Bank Europe Money2India Europe 3-4 days Exchange rate http://money2india.eu/send_money1.html This allows transfer transfer to German bank in Frankfurt. Remit2India Remit2India 4-5 days See on the website Procedure is same as above This service is used by other banks e.g. HDFC bank and they provide better exchange rate.